Are you looking for an easy, fun Halloween appetizer or Halloween treat to surprise your kids when they get home from school? How about an easy Halloween recipe that doesn’t require any cooking and you can have on the table in less than 15 minutes? Interested? Read on and find out how to make this delicious and spooky Halloween Graveyard Chocolate Cheesecake Dip. 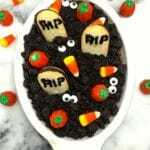 Halloween Graveyard Chocolate Cheesecake Dip is so easy and quick; even your little ones can help. 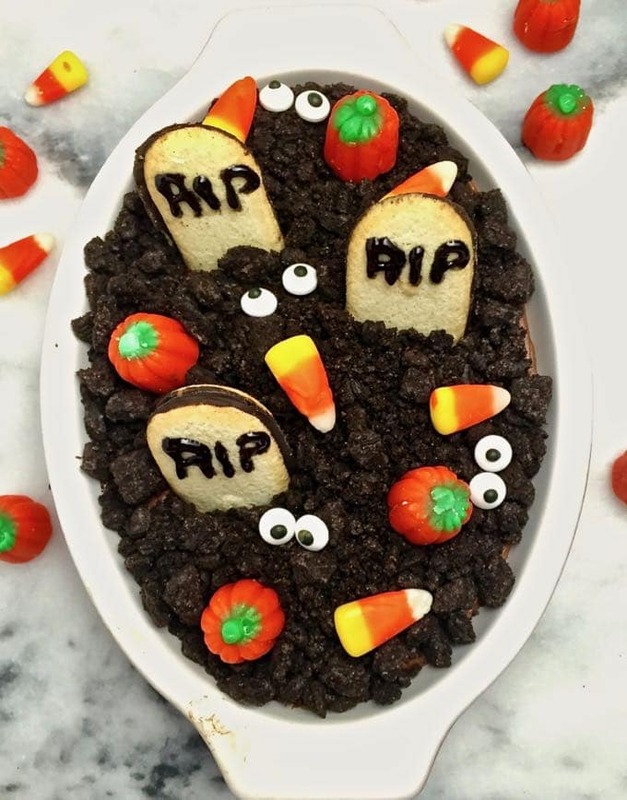 This Halloween food is topped with crisp cookie tombstones and Oreos make up the dirt. 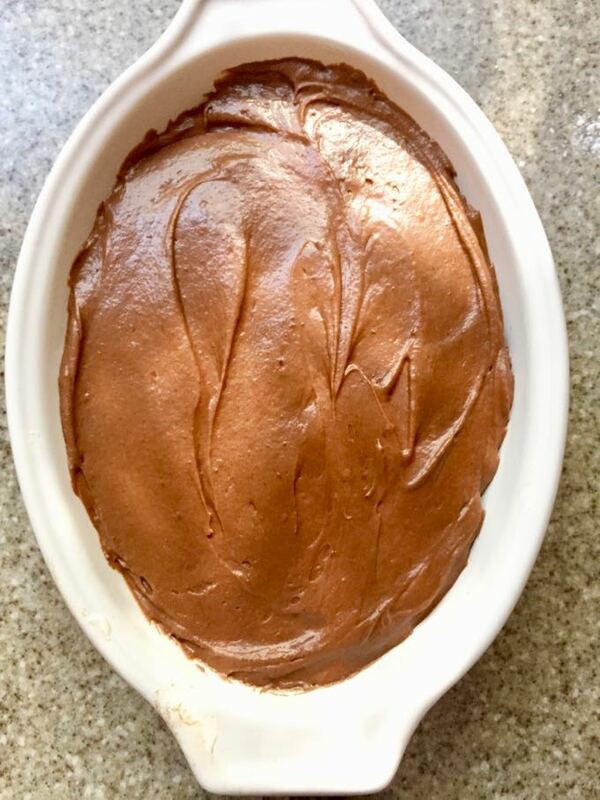 Underneath is a creamy, yummy no-bake chocolate cheesecake dip that will make you swoon! Goblins both big and little will love walking in the “graveyard” and stopping from time to time to chat with a friendly ghost or maybe just maybe have a bite of this scrumptious, decadent easy Halloween treat. If you like this fun Halloween snack idea, you might also be interested in these easy Halloween recipes: Easy Halloween Jalapeno Mummies, Halloween Spooky Spider Deviled Eggs, or Easy Halloween Meringue Ghosts. Need even more Halloween easy food ideas, check out my post 25 Spooktacularly Delicious Halloween Treats featuring easy Halloween treat ideas. How to make Halloween Graveyard Chocolate Cheesecake Dip! Graveyard Chocolate Cheesecake Dip is an easy Halloween party food with only has a few ingredients and even fewer steps. I’ll show you step by step how this spooktacular dip comes together. The ingredients for this great Halloween treat includes cream cheese, cocoa powder, vanilla extract, milk, unsalted butter, light brown sugar, kosher salt, and confectioners powdered sugar. Garnishes include Oreo cookies or other chocolate sandwich cookies for the dirt, black decorating icing, Milano cookies or another oval vanilla cookie, candy corn and pumpkins. You will also need graham crackers, vanilla wafers, gingersnaps or apple slices for dipping. When you are ready to make this yummy dip, gather your ingredients and start by adding cream cheese and butter to a medium size bowl. 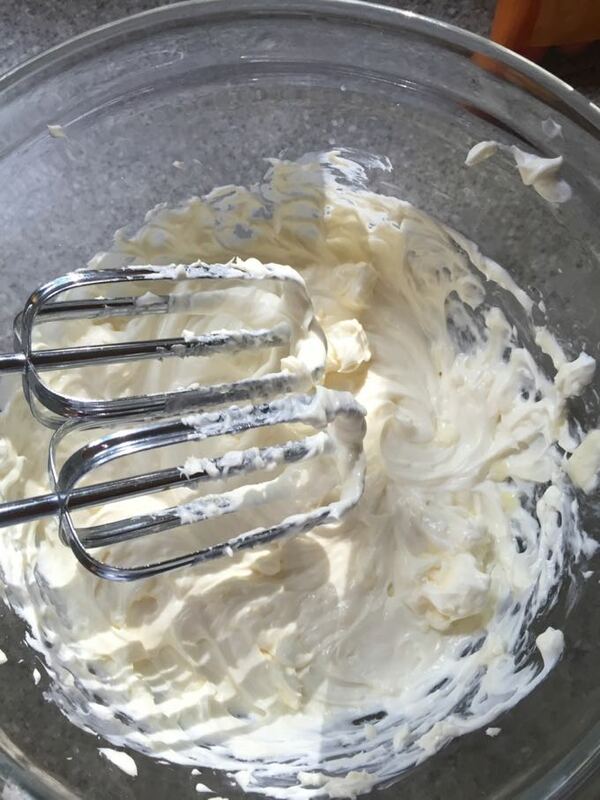 Using your electric mixer, beat until smooth. Add cocoa powder and beat until it is incorporated. Add brown sugar, vanilla extract, salt, and milk. Beat until the mixture is smooth. Sift in powdered sugar, 1/2 cup at a time, beating after each addition. Once all powdered sugar has been incorporated, turn your mixer to high and beat until the mixture is light and creamy. Transfer mixture to a small serving dish and smooth the top. Spread the crushed Oreos over the top of the dip evenly to form the dirt. 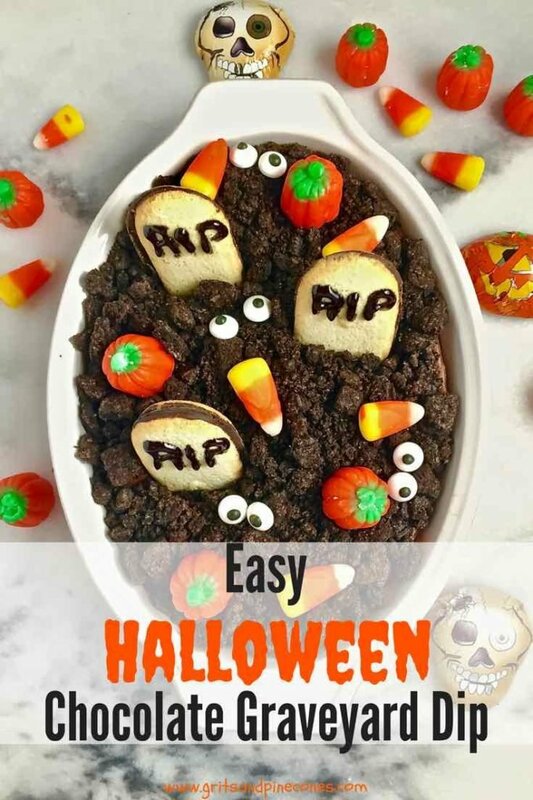 Use a small tube of black decorating icing to write the words “RIP” on the Milano cookies and insert them into the dip to form “tombstones.” Scatter candy corn and or candy pumpkins around and add googly eyes if you have them. Serve with graham crackers, gingersnaps, vanilla wafers or apple slices. *This dip may be made ahead and stored covered in the refrigerator for 3-4 days. If you are making ahead, wait to add the Milano cookies, candy corn, and pumpkins until you are ready to serve. 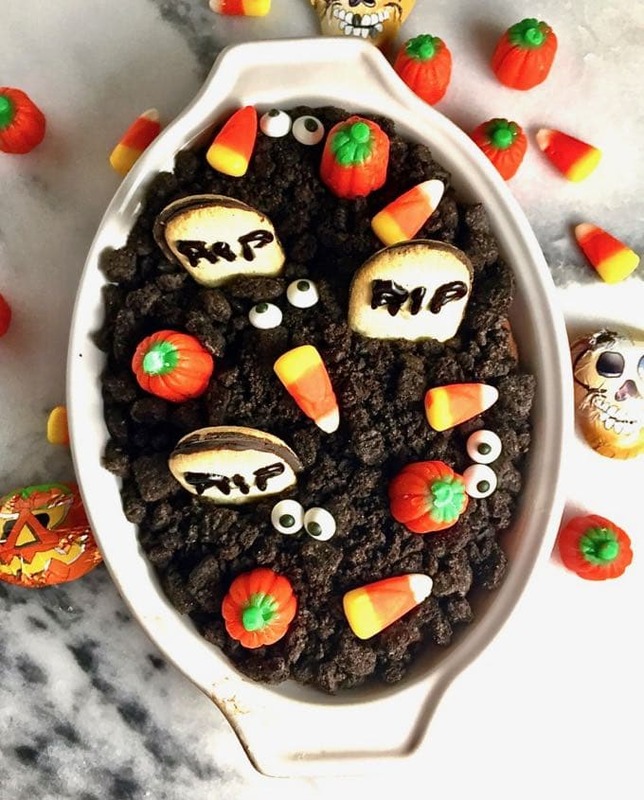 Graveyard Chocolate Cheesecake Dip is an easy Halloween recipe and this fun, spooky no-bake Halloween treat features cute cookie tombstones and Oreo dirt. Add cream cheese and butter to a medium size bowl. 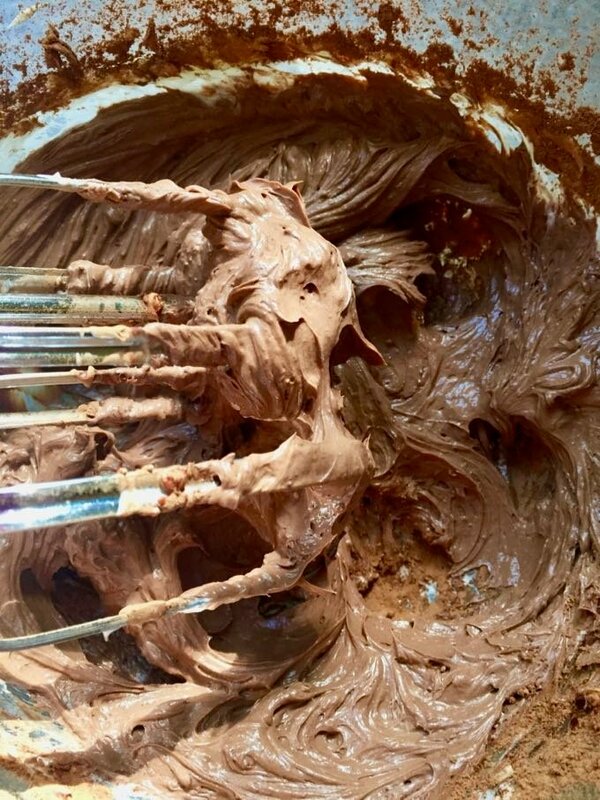 Using your electric mixer, beat until smooth. Add cocoa powder and beat until it is incorporated. Add brown sugar, vanilla extract, salt and milk. Beat until the mixture is smooth. Sift in powdered sugar, 1/2 cup at a time, beating after each addition. 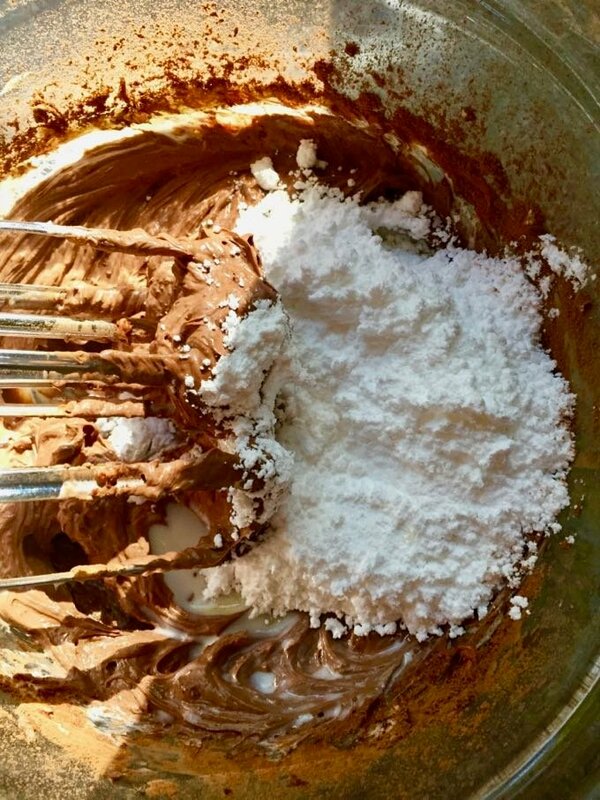 Once all powdered sugar has been incorporated, turn your mixer to high and beat until the mixture is light and creamy. Spread the crushed Oreos over the top of the dip evenly to form the dirt. Use a small tube of black decorating icing to write the words "RIP" on the Milano cookies and insert them into the dip to form "tombstones." Scatter candy corn and or candy pumpkins around and add googly eyes if you have them.